Although I've read (and quite liked) a couple of David Nicholls' other books - Starter For Ten and the ubiquitous One Day - I wasn't terribly interested in this new one until it cropped up on the Man Booker Longlist. Nicholls is a perfectly decent writer who has seen tremendous commercial success while largely avoiding the prose-critical backlash writers like Stephanie Meyer have endured. That said, for him to place on the Booker Longlist, particularly in its first year of international competition - well, I freely express surprise he would be even be entered. One night, 56-year-old Douglas Petersen is woken by his wife, Connie, to be told she's leaving him. Or rather, she will be, once Albie, their 17-year-old son is safely ensconced at University. Before that, the family have a trip planned - a Grand Tour of Europe - during which Douglas intends to win back the affection of his wife and the respect of his son via the mediums of having a strict timetable and regurgitating the Wikipedia entry of everywhere they go. Although not a deliberate comedy, Us should find a natural fan base amongst readers of The Rosie Project, itself widely compared to One Day. By the time this review is posted, I will be about to compare The Rosie Effect to Us triggering a comparative title vortex and trapping us all in a literary feedback-loop of inept middle-aged white guys. 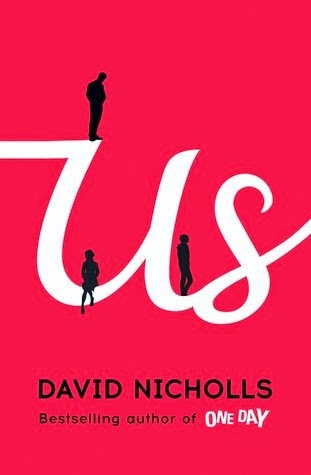 Superficially, Nicholls' Douglas feels a touch derivative of Graeme Simsion's hero Don - he is a scientist, he has a free-spirited love interest, having things organised is important to him - but unlike Simsion, Nicholls does not attempt to place his protagonist on the autistic spectrum, even though at times it feels as though he was thinking about it. Where One Day was an interesting idea adequately executed, Us is a uniteresting idea near perfectly executed. It's a good read, but the shelves are heaving with this type of thing, often done in a more interesting and engaging way. This is closer to Tony Parsons than Nick Hornby and its inclusion on on the Booker longlist is perhaps more indicative of what we're traditionally told "literature" is (straight, white and male) than any literary quality Us possesses. Although I liked it overall, I found the characters problematic. Us is the story of this broken marriage and of Douglas' attempts to unbreak it; of how it began and how it came to crack. I struggled slightly - as I did in One Day - to see why these characters cared about each other in the first place. The elements are there but the follow-through isn't. Douglas almost fetishises Connie's artistic bent (which is a pet hate for me anyway), but there's also a degree of contempt for it in the way he doesn't want Albie to pursue a career in the arts, and in the absent head-patting encouragement for her to paint - he doesn't engage with her feelings on the matter of what it is to paint, only the fact he likes her drawings. The internal conflict of this is absent, as a missed opportunity rather than an active gap. I did not like Connie. She is cruel, yet she is subject to the female-worship other SWMs like Parsons are so guilty of, her actions merely evidence of her free-spirit. Douglas loves her, but it is not a good thing. The third element, Albie, is a brat who desperately needs to check his privilege. The kind of teen who tells his father he hates him before demanding the necessary cash to extricate himself from his father's company. The kind of brat who insists on having his guitar on a train journey of Europe, and who has the kind of father who brings it. I did enjoy this. The second half is better than the first benefiting from a move away from the slightly dull realism of the beginning into the kind of book-acceptable plot Nicholls worked so well in Starter For Ten. Even so, I couldn't engage with it. For any justifiable superlative you want to offer, there are dozens of books already out there doing exactly this. Storytelling in all its forms is already dominated by male narratives and this one, while perfectly good, does nothing new. I'm going to settle on 3.5 stars, of the kind which gets rounded up rather than down. As I keep saying, it's a good book - although I do wonder if those who loved One Day because they identified with Emma will find this as appealing - despite its wider unoriginality. What it does it does perfectly well and there's no reason not to give it a whirl. I like your observation that you don't know why they don't fall for each other in the first place - that was my main problem with One Day - I could never really believe they loved each other. And this review has persuaded me that I can probably give Us a miss. Thanks! You're welcome! If you saw it in the Library I wouldn't dissuade you from taking it home, but it's probably not worth having them order it in. It's that odd combination of polished and problematic.